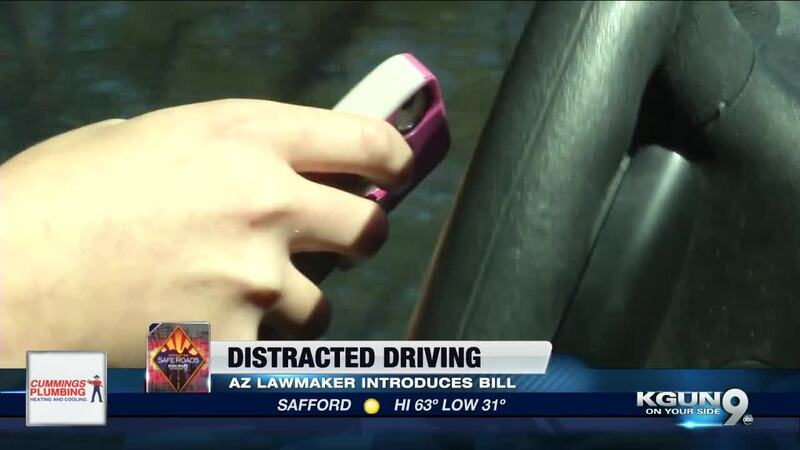 Arizona state senator Kate Brophy McGee introduced a new bill that would require to use only hands-free devices behind the wheel. TUCSON, Ariz. - Arizona state senator Kate Brophy McGee introduced a new bill that would require to use only hands-free devices behind the wheel. The announcement of SB1165 came during the annual Distracted Driving Summit in Phoenix on Wednesday Jan 23. The bill would make using your cell phone while driving a primary offense, meaning law enforcement officers can pull you over for being on your phone. In some places throughout the state, using your cell phone while behind the wheel is a secondary offense, which means there has to be a primary reason a law enforcement officer pulls you over. "A statewide law that encompasses all of the ordinances that have been adopted by the now 18 towns and municipalities around the state," said McGee. In Tucson, texting while driving is already a primary offense, but the bill would extend to other parts of the state where this is not the case. McGee went on to say she felt very strongly about introducing this bill, adding it was something she felt needed to be put in place to create safer roads. "It is a public health crisis, it is the DUI issue of our times, we can do better than this," McGee said. If passed, the law would go into effect 90 days after the legislative session is over, which is in May.